Registered member of the General Osteopathic Council, British Osteopathic Association and British Medical Acupuncture Society. The type of Acupuncture that I use is Western Medical Acupuncture which is a therapeutic modality that involves the insertion of fine needles. It is adapted from Chinese acupuncture using current knowledge of anatomy physiology and pathology. It acts mainly by stimulating the nerves in skin, muscle and other tissues and is used to treat a variety of symptoms including musculo-skeletal pains and myofascial trigger point pain. There is also an increased release of the body's natural painkillers, including endorphin and serotonin, in the pathways of both the spinal cord and the brain. 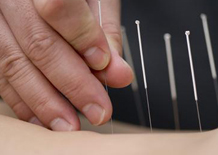 All members of the British Medical Acupuncture Society are registered healthcare professionals with orthodox training in Western medical practices, who have undergone recognised acupuncture training. Members are subject to the Society’s Code of Practice and Complaints Procedure in addition to statutory regulation within their primary profession. © 2013 - 2019 | www.mkjosteopathy.co.uk | All rights reserved.